This piece was inspired by an old woodcut engraving that has captured my imagination for a long, long time. 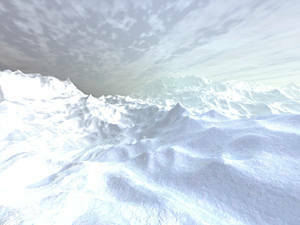 I used Lightwave 11s excellent instancing system to render the sky and Vue d'Esprit for the foreground. "8 on theme, 9 on rendering"
The sub-title might well be "waiting for annihilation", which might even tie in with Jamie's and Rene's comments. Pride goeth before destruction. Which might tie in with Carysta's comment. All in all, it makes me think that with that amount of debris in-bound, they won't have long to admire the beautiful sky before they're obliterated. Sometimes even complete destruction can be magnificent - you just don't get a chance to comment on it afterwards. I really like this image. It makes me think of the part of C.S. Lewis's last Narnia tale, The Last Battle, when the stars are all coming down to earth. Sorry I missed uploading that one. The 5760 x 1080 is available now. Love it but no 5760x1080 yet? Just stunning. Gorgeous flurry of colors. And .. wait .. is that a silhouette of two people embracing in the foreground?? My .. allergies .. dust particle .. eyes .. watering ..
how about in celebration of SCOTUS overturning the Prop 8 decision, a picklejar version with shadows of two guys? i'd be a fan (and subscriber) for life. Would of rated it a nine if thr couple were drinking wine. Thanks, Ryan! I gave it a 10 - I like the multicolored explosions (or whatever) on the horizon. 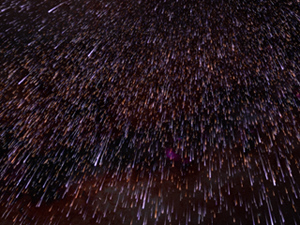 Some nice changes to the falling stars, too. But I do wish we could have a Pickle Jar version without the cuddling couple. I love the image and complexity in layers. It seems a blending of Dodenfell, Eldritch Mountain, Thetis Tropic Night and for some reason (probably purple lightning) Eye of Aquilae/Magnetar all backing up Tears on steroids ... nicely done. It's too complicated with variety of images that are not pleasant to look at. This reminds me of a dream I had where the world was ending and it was this event everyone was flocking to the park to watch. It was strange and beautiful, but not scary. I added them last week actually, but forgot to upload the 1080 x 1920 for this piece. It should be there now. Just a suggestion: With so many 1080p android handsets rolling out, and being an owner of one, I notice that there's a lack of 1080x1920 mobile wallpapers. I love this piece mostly as it is. When I first looked at it, it seemed that this was an event that was rolling toward them and just about to hit. I don't feel this is a piece that should have lots of bright, cheery colors, and I think that you have captured that 'it's about to hit the fan' feeling! I would like to see a little less cloud cover, but then again, maybe that helps with the ambiance. @Heather - I love that you mentioned the Pern series; haven't thought of that in years, and you are right about the Threadfall! :-) Thanks Ryan; I love looking forward to what you are going to do next! I'm going to second SaltNPepper's comment below--consider changing nothing. I think this one works really well the way it is. It's got a story, and drama, and is also nicely balanced artistically, in my opinion. I totally agree with D. Definitely add more lights, and rid the clouds so we can see some impacts.. I bet adding a few impacts in the foreground water with some splashup effects would look great. Also, I'd love to see a picklejar version with the blue-green algae color that Michael spoke of. ...and say leave it just the way it is. Maybe its the writer in me, but I love this piece. Its very...evocative, end-of-the-world piece. It kind of reminds of the scene of DeepImpact, where instead of leaving, that newscaster lady (Jenny? actor Schell?) spends her final moments on the beach with her estranged father, watching the tsunami come. I think its like that. For some people, if you *know* the end of the world is coming and there's nothing you can do...spend it with family. Make all that you do, count. For that...10 all the way. "Re: Lights on the Horizon"
Add lots more and not just on the horizon. 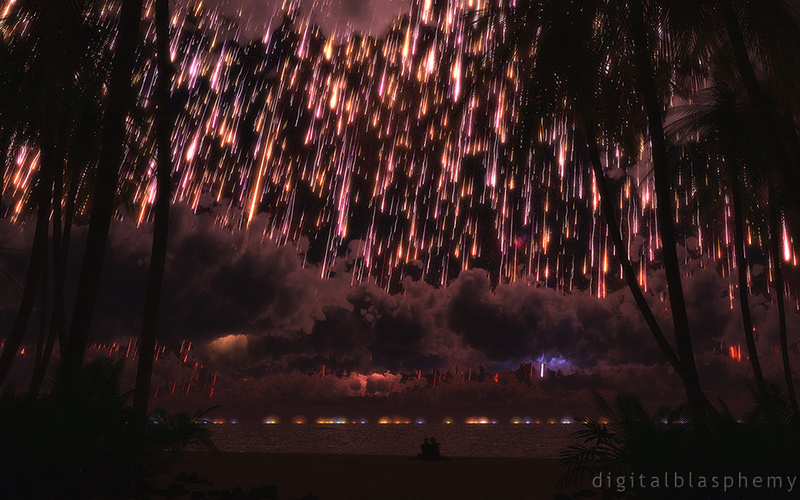 Also, remove the clouds on the horizon and show trails all the way into the impacts. I agree with Gene, the horizon lights need variation. Also the water looks too serene for the catastrophic impacts. Seems like there should be big splashes, waves, ripples, tsunamis and stuff. I like the lights on the horizon just as they are (I think of it as fire on the horizon), and I agree with Jenanne about the impact of less or more. As it stands, the picture is very balanced, in my view. My new background. I especially like the couple at the bottom, nicely offsets what at first glance appears to be a pretty hostile scene. Any chance for different colorations of this in the pickle jar? I'd love one in a flourescent-algae-ish blue-green. Looking forward to 3840x1200 version! Lights on Horizon? To me, they look too similar and "orderly." I'd like to see them more chaotic and scattered. Not a major issue, though. I'd love to see this in a different colour palette - moody blues and blacks with starlight/fire perhaps? What do you guys think about the lights on the horizon? Should I get rid of them, keep them, or double-down and add more? @Logan, good answers! Might I add the last movement of Mahler's Second? It depends on if I had an underground bunker deep enough to save me. Currently that would be a big no. Anyhow my 5 yr and 1 yr old both like this image. Next question: What music would you listen to while watching the flaming apocalypse? I'm thinking either the 1812 Overture or Barber's Adagio for Strings. Ahhhh Ryan, I can see how folks would say that from behind a computer screen, in secure, air-conditioned comfort, but I stand firm in my belief that if REAL flaming rocks began cascading from the heavens, it would take a stout heart indeed to sit back and just wait to get splatterfried. I asked this question of my Facebook fans and the response seems to veer overwhelmingly towards sitting down and taking it all in. The sand however seems a bit too flat and smooth. It's a stunning image, very nicely executed. Somewhere a long time ago I had seen that woodcut (or something like it), and marveled at the impression that must have made upon the people of the time. In my opinion, however, there is one little fly in the ointment: human psychology. Someone else already touched upon it, but if anything remotely like this were happening on MY planet, I would be RUNNING FOR COVER, not sitting on a beach taking it in... Running probably wouldn't do much good, but still. Overall, yet another fine work Ryan. Thanks, and keep 'em coming! Fantastic, though I prefer to think of it as a harmless meteor storm. I'd also prefer to see a version without the palm trees. Unless I look closely, the dark areas in the upper corners (from the palm silhouettes) look more like large variations in the storm's intensity. I really like the scene, but I find the perfectly hemispherical collision-lighting-domes really distracting. I'll be Photoshopping those out before this one earns it's place on my desktop. As always though, great concept and overall... beautiful work! Maybe this world is where the Leonids go home to grow up into big, strong meteors and raise their own families. What about placing the couple (and the shoreline) a little higher in the scene? 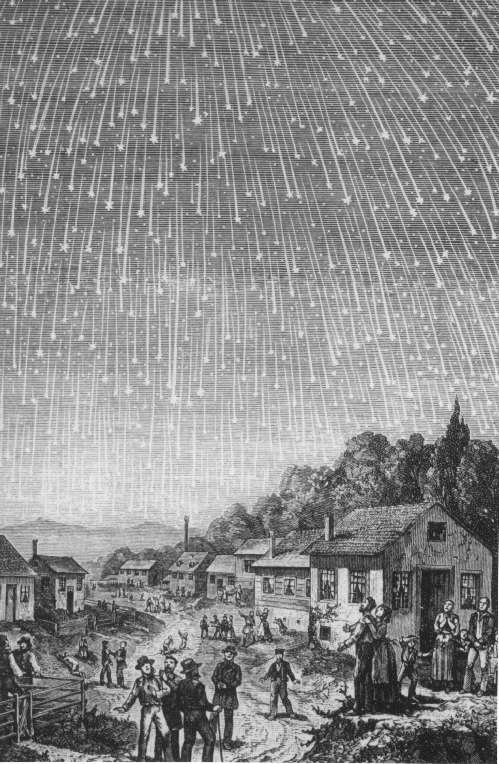 Here's some info about the 1833 meteor storm. Does anyone know the backstory on the original woodcut? I thought I saw a reference in the comments but not so. Really like it but I would like to see less stars. Maybe even just a single shooting star. Well done! If the sky looked like this, where would you run? I'm often asked why I put the people in my images. I'm of the opinion that when you add a character (or two) you turn a picture into a story. "Re: not a benign event"
I really wanted to leave no doubt that this was not a benign event, the lights on the horizon the the first impacts after all, so I wanted there to be a staggering number of falling stars. Adding a version without the couple on the beach should be pretty easy though. This is a great image, great coloring, really cool idea. I love this one, and would have given this a 9... I just feel that there are way too many stars falling. It seems too cluttered to me... perhaps lessen the amount of falling stars? I absolutely love this render. And although some have said they don't like the people in this render, I think the couple on the beach is very fitting for this particular render. Great job Ryan. Have been a lifetime member for a couple of years now and love your work. Love this picture. I like the couple on the beach sitting peacefully watching all the star fall. Seems a little apocalyptic, but if its inevitable might as well enjoy the show. I would definately class this as end of the world more than meteor shower though with the angle of the shooting stars and the sheer number. I do like this effect though. Generally - it is wonderful. Still - overall, it is a NINE. Really neat image. But, if the lights in the distance are fires that have been set by the meteor shower, I'm not so sure I'd want to be on that beach watching it! 8 for now but know the 10 is coming. I love the concept and will trust your judgement on the revision. For me this a more epic version of Nightfall which I also love. Also I enjoy the couple as I imagine any romantic would. Excellent work as usual Mr. Bliss. "Well, the dragonriders are toast. Egon, what've you got?" Reminds of the Dragonriders of Pern series and the Threadfall they faced often. Very cool! Very cool and I really like the piece that inspired you. I would suggest reducing the number of shooting stars a bit, dropping the palm trees and some of the clouds to open up the sky. Also perhaps consider adding some rocks intermixed with the foliage on and around the beach. I've posted this one to the gallery pretty much without change from the preview version. Decided to develop this one "in the open". My gallery version will be properly cropped. ..liking it so far, Ryan. I suppose you've alreay tried various other colour (brit spelling, sorry) options, as the effect is quite often a surprising changed (but you already know this)... Thumbs up from this end! I was going to comment on a new pickle jar variate, and was greeted by this sweet image after logging in. I cannot wait to see the final product. This is one awesome picture. 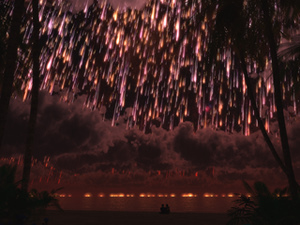 I love the "fire rain" but I suppose it could be a huge downfall from fireworks. Either way it is an impressive image. I actually like the people, but they are so far down in the frame that they are blocked by the windows taskbar if I put it as my wallpaper. It's good but I feel like it's repetitive compared to your previous works. Don't be afraid to break out new concepts. I suggested treehouses, such as a secluded village of exotic looking treehouses in the middle of a rainforest, or something. I had a dream like this once, but at the end of it, everybody died. That being said, it looks like these folks are just waiting for it to end, but at least they are together. The first word out of my mouth when I saw the work in progress was "COOOOOOOL" :) I love the engraving. Can't wait to see the finished product! "It full of stars!" It doesn't need people in it to experience the wonder, I do agree with others on that. Love it a tad more sliver from the sky would be cool, would make a good mix sliver and gold. "Not sure if meteor shower or exploding Death Star"
It looks great. I actually like having the people in this one. I look forward to finding out what is actually falling from the sky. If they were fireworks I would expect their to be more of a pattern/design to them falling. There seem to be quite a few of them for it to be a meteor shower too. Thus, my current conclusion is that it must be the flaming shrapnel remains from an exploding Death Star falling on the nearest planet. I think Joe should just do the griping, since he seems to agree with the sentiment ;) But yes, I would be happiest if the humans were replaced with a curious animal of some sort. People aside, I love it. Exciting. I didn't know what to expect after your comment this morning, but I like this a lot. Although your meteor (or whatever... sparks?... fireworks?) density may be a bit high. I predict someone gripes about the people, though. Someone always does. My first reaction was "Shiny!" Reminds me of Tears From Heaven (2010). ...or the worlds largest "oops" moment happened offscren. Good work so far.